AND MINI T.O.U.R.s AROUND THE WORLD. ﻿WE NEED VOLUNTEERS!﻿ SIGN UP TO BE TEAM CAPTAIN IN YOUR AREA TO HOST A 'MINI' T.O.U.R. BE THE SOLUTION! One of our amazing stops in Iowa, speaking to an eco friendly school group! 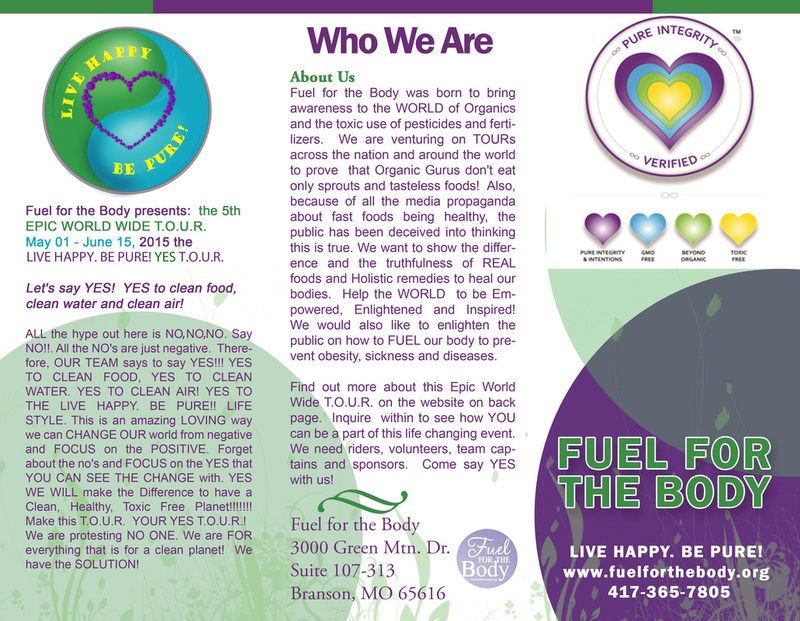 What a great way to get involved with YOUR right to a toxic free world and take a stand to 'FUEL' your body properly! WITH ALL OF YOUR COMMUNITIES! THIS IS THE SOLUTION TO OUR DEMANDS! COPY, PRINT, SHARE WITH YOUR COMMUNITIES!!! this is front and back brochure! Creator of the FFTB T.O.U.R. a true Grass Roots effort to Empower and Heal the WORLD. Read her story in the bio section on this site. Lynnette is YOUR Minister for the Environment, Certified Medicine Woman and YOUR voice for a PURE and Clean PLANET! Rachel joins forces with the LIVE HAPPY. 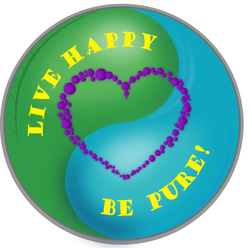 BE PURE! TOURs from Missouri. Welcome Rachel as our Programs Facilitator. She is an RN and BSN. Bringing her expertise from the western medicine world to help others understand what is really happening in the food and drug world. She is a nutritional and wellness coach. Rachel brings to us, sincere and positive outreach. 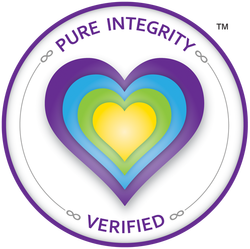 She helps us to screen companies in which would be in consideration in qualifying for the Pure Integrity Verified seal of approval. Welcome our official T.O.U.R. and PIV Attorney, A. J. Arias. A.J. is a graduate of Quinnipiac University School of Law. He is a member of the Connecticut State Bar and the Federal Bar for the United States District Court of Connecticut. Patricia Davis is a professional dressmaker and fashion designer. She is the Owner of Silver Needle & Thread Custom Sewn Clothing, Silver T-Models, Tag Custom Bridal and The Jacksonville Organic Business Directory. Patricia is also the Creator of CATA “Consumers Against Toxic Apparel,” the first movement of its kind in the United States. She is a champion for organic apparel. Clean, safe organic clothing is the main focus of her companies. Pat comes to us to help with media outlets, activism and keeping us in the know about the use of recycling methods that may not be as carbon friendly as we may think. She is also on our Officers and board of advisers for the Pure Integrity Verified Seal of Approval. Find more about Pat HERE. Madeline comes to us from Long Island, NY. She has a great blog spot at Mommas Organics. Madeline is as equally passionate as Lynnette in the crusade for clean food, water and air. She brings us the organized side of the spectrum. She is a diligent activist with great outlooks on what companies have and what they can offer for a pure and toxic-free world. 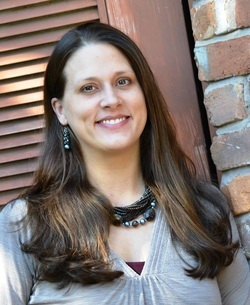 Madeline is the author of "Unmasking the Toxic 10". You can find this on her site HERE. We are excited to have as part of our FFTB Team. She is also our Long Island, NY Team Captain. Fuel for Your Body NOT Your Car! how to live toxic FREE! FOODS, WATER, TEXTILES AND AIR!